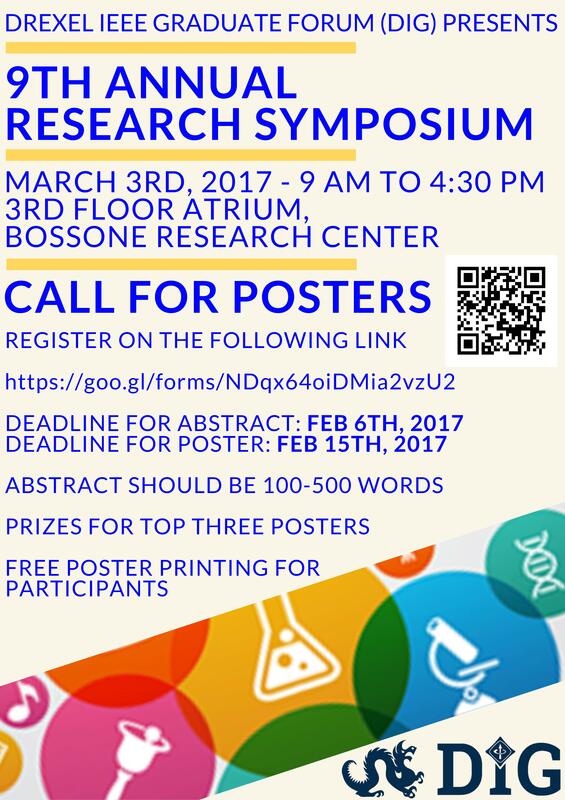 The Drexel IEEE Graduate Forum (DIG) would like to invite you to the 9th Annual Research Symposium on Friday, March 3rd, 2017. Every year, DIG organizes a research symposium as a venue for students to present their research to their colleagues, while also providing a venue for networking and socializing. The symposium is open to all graduate students. DIG has lined up a day’s worth of activities including keynote speakers, a poster session, breakfast, lunch, and an award ceremony for the best poster presentation. Posters will be evaluated based on originality, presenter’s knowledge, visual presentation, and content by faculty members. 1st, 2nd , and 3rd place posters win cash prizes!!! Deadline to submit abstract: Monday, February 10th, 2017. Deadline to submit final poster: Wednesday, February 15th, 2017. Abstract should be 100-500 words.